This post Small Stocks Are Set For BIG Gains appeared first on Daily Reckoning. What's that? You thought the market was still in a correction? You must be looking at the wrong chart? Because today ? and actually for more than two weeks ? stocks have been making new all-time highs. When investors hear about the "stock market" on a particular day, most think about the Dow Jones Industrial Average (or simply the "Dow"). The Dow is an average of 30 of the biggest U.S. stocks. In short, the Dow is a horrible way to measure how the market is doing. And it's not helpful to compare your own returns to the Dow's gain or loss. I'm assuming you don't invest 100 times as much of your money in Apple as you do in shares of a smaller company. This is the Russell 2000 small cap index. It's an index made up of 2,000 smaller companies listed on the U.S. exchanges. And as you can see, this small-cap index hit a new high yesterday after recovering nicely from the volatility earlier this year. As an investor, I'm always looking for ways to grow the value of my account. There are times when it makes sense to look at big companies with solid balance sheets and established businesses. That's because these companies typically have stable outlooks and can have less risk. For starters, small companies have more room to grow simply because of the fact that they're small! Apple has pretty much saturated the market for smartphones, computers and tablets. Sure, the company will continue to roll out new products to its customers. But you can't expect a huge percentage gain in sales because of the huge base Apple already has. This is just one example, but Peabody is a niche natural gas player in the U.S. With annual revenue of just $1.5 billion, it wouldn't be too hard for the company to drill some new wells or to realize higher prices on its natural gas production ? and quickly double its revenue! Small companies have more potential for growth simply because they haven't saturated their market yet. A strong U.S. dollar makes it harder for companies with international sales to compete. That's because it's more expensive for international clients to buy products with weaker euros, yen or other currencies. 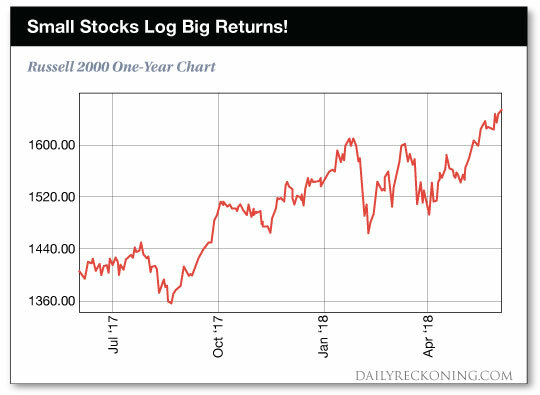 That's why we're seeing such strength in the Russell 2000 index, even while the S&P 500 is struggling to get back to where it was trading before the February pullback. That's why today, I'm spending a lot of time looking through the smaller stocks listed in the Russell 2000 index and finding some of our best opportunities in smaller names that are off the beaten path. You can easily do a Google search to find small cap opportunities in specific sectors of the market. In particular, I've been looking for small retail companies with strong brand loyalty, technology companies with new ideas, and small cap banks that are benefiting from deregulation. There are plenty of opportunities in today's market if you look beyond the headlines. So don't let the "weak" market or the media's fear tactics keep you from generating attractive profits. The post Small Stocks Are Set For BIG Gains appeared first on Daily Reckoning.